Cornish Pirates coach Ian Davies says his team showed "great character" to score two tries in injury-time to secure a 31-20 victory against Jersey. Jersey led the British & Irish Cup tie 20-17 in the dying moments, only for two quickfire touchdowns to give the home side an unlikely bonus-point win. "Going into injury time, I thought a draw would be nice. 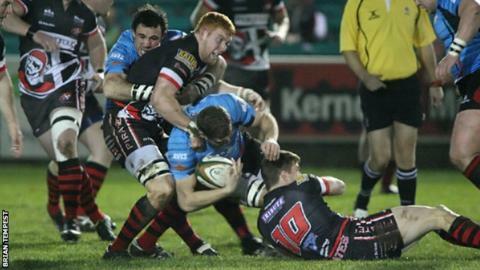 "But the boys stuck at it and to pick up a bonus-point win is fabulous," Davies told BBC Radio Cornwall. "They showed great character but I don't know about game management. After our third try we should have got the ball off the park, but Gavin Cattle got charged down and then Angus Sinclair didn't make touch just to entertain he crowd a little bit more. "There seems to be a bit of confusion with how much time was left, but at the end of the day we got another try." The Pirates had taken a 14-0 lead before Jersey, without a head coach, following Ben Harvey's resignation last Thursday, battled their way back into the match. "The 14-0 score flattered us a little bit and Jersey had dominated for large parts of first half," admitted Davies. "They'd cut us to pieces on two set-plays and I said at half-time that we were lucky to still be in the contest because I thought Jersey could have gone in 10 or 12 points ahead."